It is hard to believe that another year is coming to a close! 2014 proved to be another very busy year for the Southern Accents team. We started the year with a home town salvage mission as we rescued architectural elements from the historical Hays House. The demolition dust had barely cleared the air and we hit the road and headed north on an antiquing trip to Philly. This trip was the first of two buying trips up north, the second taking place in September. April saw us head south to Greenville, Alabama for another salvage mission as we rescued more architectural elements from an 1890’s house scheduled for demolition. The month of May came quickly as we prepared for Southern Makers 2014. This highly successful event will be expanding in 2015 to two days, May 2nd & 3rd. June was an exciting time as we designed and built staging for NASA On The Square! We also traveled to Atlanta for the Haven Bloggers Conference. Summer quickly turned to fall and we loaded the truck and headed south once again, this time to Chapel Market in Pike Road, Alabama. As the year began to wind down, Southern Accents traveled to New York in November to attend the BizBash Event Style Awards. We were honored to represent Southern Makers winning a prestigious award for event decor. We also attended the BBB luncheon in Huntsville as Southern Accents was a BBB Torch Award finalist. Looking ahead to 2015 there are quite a few exciting events on the horizon, many we will be sharing with you in the coming weeks! Thank you for following along with us as we continue our mission of rescuing, restoring, and protecting architectural elements of historical significance. We are looking forward to 2015 and what we expect to be our best and most exciting year ever!! A search for claw foot tubs on Pinterest will return an endless list of gorgeous tubs. These tubs, which evoke a sense of elegance and serenity, are gaining in popularity. Most of the tubs sit on 4 feet and the majority of the feet are some form of a “ball and claw” design. We have customers come to our showroom on a regular basis looking for tub feet. What most don’t realize is that the tub feet are not interchangeable from tub to tub! Quite often a customer will visit Southern Accentsshowroom looking for replacement feet or a single foot to replace a broken or missing leg on their old tub. When shopping for a single replacement foot, you must bring one of the feet with you in order to find an identical match. If looking for a set of feet, you will need to bring the actual bath tub to ensure a perfect fit. Tubs are custom fitted for their specific feet when cast therefore each type of foot has a unique peg connection, peg length, and curvature of the top of the foot that must match your tub. When purchasing an antique claw foot tub, ensuring that the tub comes equipped with properly fitted feet, will save you a lot of headaches and disappointments! 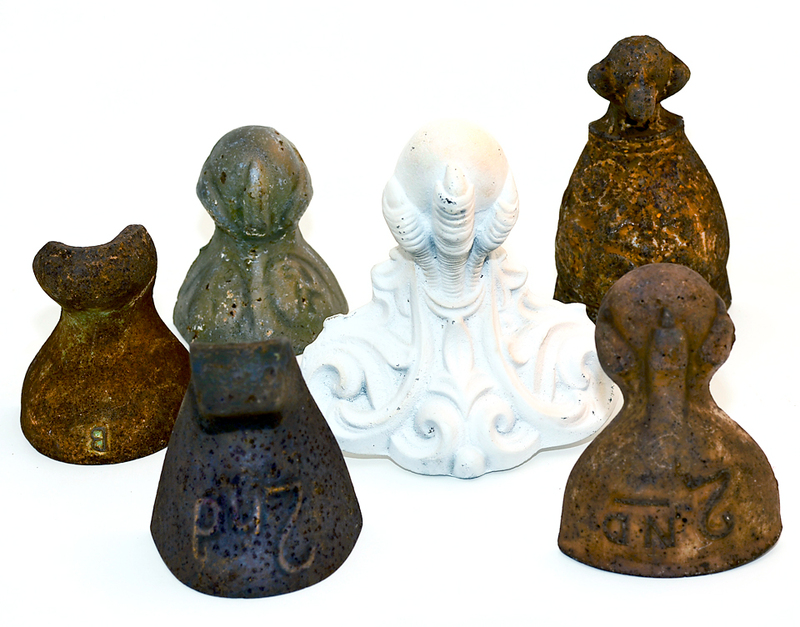 Our collection of antique tub feet includes a wide variety of designs ranging in style from simple to very ornate. The heavy iron feet also make great door stops and book ends! We’ve even seen them used on coffee tables and other furniture pieces. A little imagination is all it takes to come up with creative ways to repurpose these fabulous pieces! Stop by our outdoor lot and browse our unique collection of antique claw foot tubs and tub feet! History has it that the ball and claw foot design was originally derived from the Chinese. The claw symbolized the foot of a dragon guarding a pearl, a symbol of wisdom, from evil forces. The design was introduced in Europe through trade and was popular in the early 1700’s. While England favored a lion’s paw, American designs, which were popular until the late 1700’s, favored an eagle’s talon. Antique furniture experts can tell the origin of furniture pieces featuring this foot design by the character of the ball and claw feet. 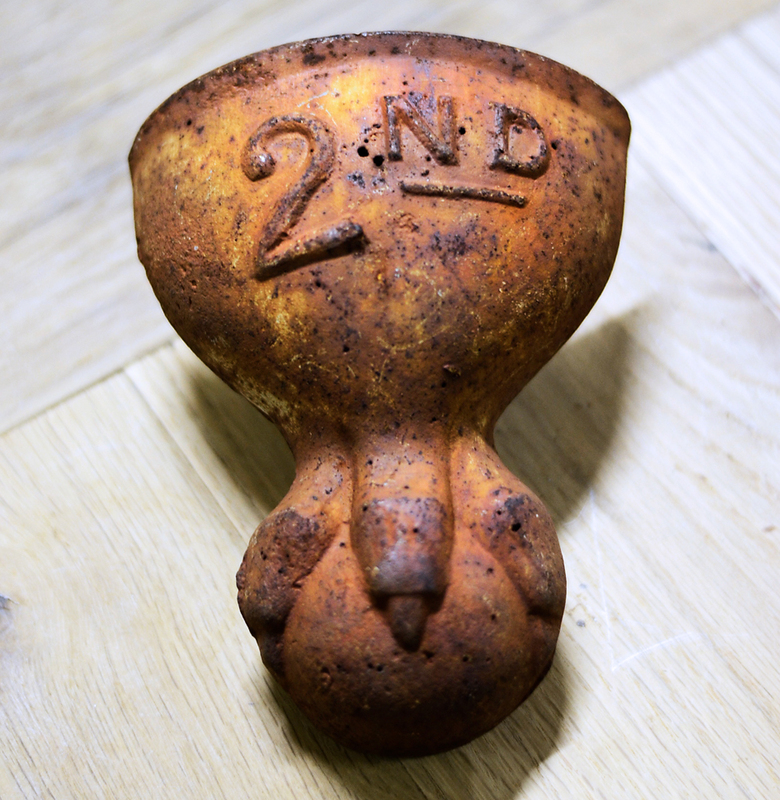 Many of the feet, like the one shown to the left, have an embossed makers mark. These markings, when present, can help identify when and where the feet were cast. 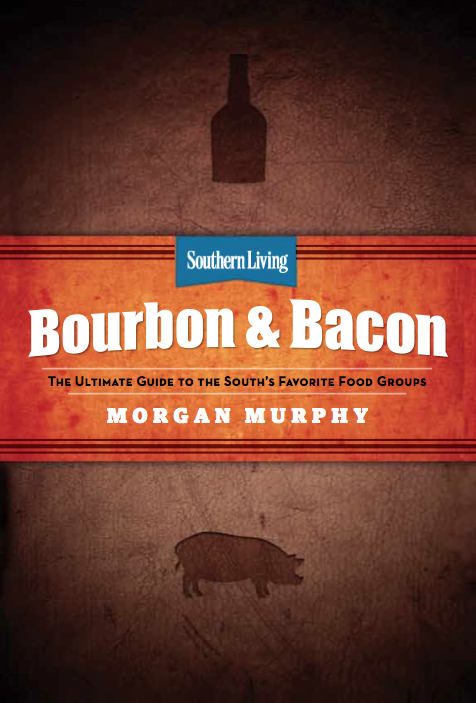 Author Morgan Murphy will be at Southern Accents Saturday, December 6, from 11:00 am till 1:00 pm autographing copies of his latest book Bourbon & Bacon – The Ultimate Guide To The South’s Favorite Food Groups. We are thrilled and honored to have our friend Morgan join us on Saturday! Stop in, meet Morgan, and visit with the SA Team! Can’t make it on Saturday… not a problem! You can pre pay for your copy/copies of Bourbon & Bacon. We will have Morgan autograph your book and you can pick up your order at our showroom next week. The books are $22.95 each plus tax. Give us a call at 877 737-0554. Books can be purchased over the phone via credit card.